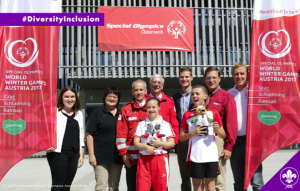 Last week, Dominik Habsburg-Lothringen, President of Pfadfinder und Pfadfinderinnen Österreichs , the National Scout Organisation in Austria, joined representatives of the Österreichisches Rote Kreuz (Austrian Red Cross) and the Steirische Landjugend (Rural Youth of Styria) in Schladming (Styria), one of the host cities of next year’s Special Olympics World Winter Games 2017, when they signed a cooperation agreements with the Host Committee of the event. “With more then 80000 affiliates, the Scouts and Guides of Austria are part of the world’s largest Child and Youth Movement, the World Organization of the Scout Movement (WOSM). 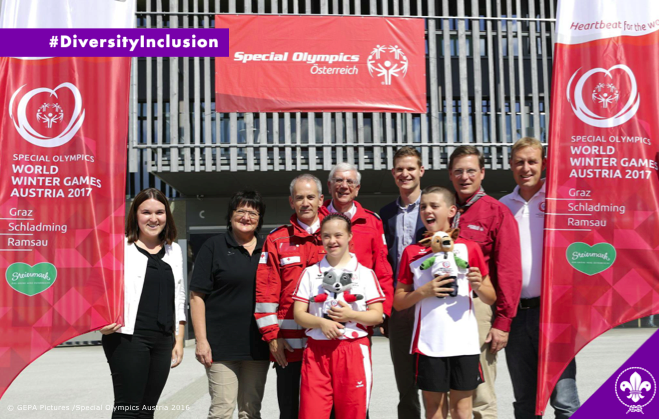 You find Scouts and Guides in all corners of the world – and therefore also in the countries of the athletes who will gather at the Special Olympics 2017 in Austria next year,” Mr Habsburg-Lothringen explained. The Scouts and Guides will join members of local Rotary Clubs and provide their services as part of the Host Town Programme in Styria in March 2017.